Elasmobranchs lack swim bladders, and maintain buoyancy with oil that they store in their livers. Some deep sea sharks are targeted by fisheries for this liver oil, including the school, gulper and basking sharks (pictured). All three of these species have been assessed by the IUCN as vulnerable due to overfishing. 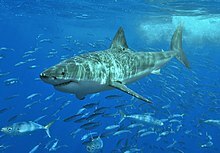 Elasmobranchii (/ɪˌlæzməˈbræŋkiaɪ/) is a subclass of Chondrichthyes or cartilaginous fish, including the sharks (superorder Selachii) and the rays, skates, and sawfish (superorder Batoidea). Members of this subclass are characterised by having five to seven pairs of gill clefts opening individually to the exterior, rigid dorsal fins and small placoid scales on the skin. The teeth are in several series; the upper jaw is not fused to the cranium, and the lower jaw is articulated with the upper. The details of this jaw anatomy vary between species, and help distinguish the different elasmobranch clades. The pelvic fins in males are modified to create claspers for the transfer of sperm. There is no swim bladder; instead, these fish maintain buoyancy with large livers rich in oil. The earliest elasmobranch fossils came from the Devonian and many surviving orders date back to the Cretaceous, or even earlier. Many species became extinct during the Permian and there was a burst of adaptive radiation during the Jurassic. Many fish maintain buoyancy with swim bladders. However elasmobranchs lack swim bladders, and maintain buoyancy instead with large livers that are full of oil. This stored oil may also function as a nutrient when food is scarce. Deep sea sharks are usually targeted for their oil, because the livers of these species can weigh up to 20% of their total weight. Elasmobranchs are mostly a marine taxon, but we know several species that live in freshwater environment (approximately 60 species which represent only 5% of the 1154 described species). They can be divided into two groups. The euryhaline elasmobranchs, which are marine species that may survive and reproduce in freshwater environment, and the obligated freshwater elasmobranchs. The second group contains elasmobranchs that only lives in freshwater environment their entire life. This group contains only one clade: the subfamily Potamotrygoninae. This clade is endemic to one specific region (which means that they can only be seen in those regions): tropical, subtropical water and wetland of South America. Recent researches in Paraná river have shown that obligated freshwater elasmobranchs were more susceptible to anthropogenic threats as overfishing and destruction of habitats due to the very small place they live in compared to the marine species. ^ Fowler, S.L. (2005). "Cetorhinus maximus". The IUCN Red List of Threatened Species. 2005: e.T4292A10763893. doi:10.2305/IUCN.UK.2005.RLTS.T4292A10763893.en. Retrieved 24 December 2017. ^ Guallart; et al. (2006). "Centrophorus granulosus". IUCN Red List of Threatened Species. Version 2006. International Union for Conservation of Nature. Retrieved 11 May 2006. ^ Benton, M. J. (2005) Vertebrate Palaeontology, Blackwell, 3rd edition, Fig 7.13 on page 185. ^ Wilga, C.D. (2005). "Morphology and evolution of the jaw suspension in lamniform sharks". Journal of Morphology. 265 (1): 102–19. doi:10.1002/jmor.10342. PMID 15880740. ^ Wilga, C. D.; Motta, P. J.; Sanford, C. P. (2007). "Evolution and ecology of feeding in elasmobranchs". Integrative and Comparative Biology. 47 (1): 55–69. doi:10.1093/icb/icm029. PMID 21672820. ^ Wilga, Cheryl A.D. (2008). "Evolutionary divergence in the feeding mechanism of fishes". Acta Geologica Polonica. 58 (2): 113–20. ^ Bone, Q.; Roberts, B. L. (2009). "The density of elasmobranchs". Journal of the Marine Biological Association of the United Kingdom. 49 (4): 913. doi:10.1017/S0025315400038017. ^ Palmer, D., ed. (1999). The Marshall Illustrated Encyclopedia of Dinosaurs and Prehistoric Animals. London: Marshall Editions. p. 26. ISBN 978-1-84028-152-1. ^ Lucifora, Luis O.; Balboni, Leandro; Scarabotti, Pablo A.; Alonso, Francisco A.; Sabadin, David E.; Solari, Agustín; Vargas, Facundo; Barbini, Santiago A.; Mabragaña, Ezequiel; Díaz De Astarloa, Juan M. (2017). "Decline or stability of obligate freshwater elasmobranchs following high fishing pressure". Biological Conservation. 210: 293–298. doi:10.1016/j.biocon.2017.04.028. ^ Winchell, Christopher J; Martin, Andrew P; Mallatt, Jon (2004). "Phylogeny of elasmobranchs based on LSU and SSU ribosomal RNA genes". Molecular Phylogenetics and Evolution. 31 (1): 214–24. doi:10.1016/j.ympev.2003.07.010. PMID 15019621. ^ Douady, Christophe J.; Dosay, Miné; Shivji, Mahmood S.; Stanhope, Michael J. (2003). "Molecular phylogenetic evidence refuting the hypothesis of Batoidea (rays and skates) as derived sharks". Molecular Phylogenetics and Evolution. 26 (2): 215–21. doi:10.1016/S1055-7903(02)00333-0. PMID 12565032. This page was last edited on 9 April 2019, at 02:40 (UTC).